In Conflict and Order: Understanding Society examines society from a conflict perspective, prompting students to ponder one of the central questions of sociology: Who benefits from the existing customs and social order, and who does not? 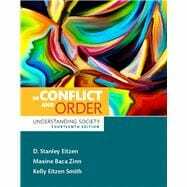 Via their conflict-centered approach, authors D. Stanley Eitzen, Maxine Baca Zinn, and Kelly Eitzen Smith offer a realistic appraisal of society and lead students to think critically about existing social arrangements with an eye toward restructuring society along more humane lines. The fourteenth edition offers expanded coverage of contemporary topics, including the changing economy and conflicts over immigration, to reinforce how the issues in today’s headlines can be understood through the lens of sociology. In Conflict and Order: Understanding Society , Fourteenth Edition is also available via REVEL™, an interactive learning environment that enables students to read, practice, and study in one continuous experience. D. Stanley Eitzen is professor emeritus in sociology from Colorado State University, where previously he was the John N. Stern Distinguished Professor. He received his Ph.D. from the University of Kansas. Among his books are: Social Problems (which was awarded the McGuffey Longevity Award for excellence over multiple editions in 2000 by the Text and Academic Authors Association); Diversity in Families and Globalization: The Transformation of Social Worlds (each coauthored with Maxine Baca Zinn); Experiencing Poverty: Voices from the Bottom (with Kelly Eitzen Smith); Inequality: Social Class and Its Consequences (coauthored with Janis E. Johnston); Solutions to Social Problems: Lessons from Other Societies; Solutions to Social Problems from the Top Down; The Role of Government (with George H. Sage); Solutions to Social Problems from the Bottom Up: Social Movements (with Kenneth L. Stewart); Paths to Homelessness: Extreme Poverty and the Urban Housing Crisis (with Doug A. Timmer and Kathyrn Talley); Sociology of North American Sport (with George H. Sage); and Fair and Foul: Rethinking the Myths and Paradoxes of Sport. He has served as the president of the North American Society for the Sociology of Sport and as editor of The Social Science Journal. Maxine Baca Zinn is professor of sociology at Michigan State University, where she is also senior researcher in the Julian Samora Research Institute. She received her Ph.D. from the University of Oregon. Her books include: Women of Color in U.S. Society (with Bonnie Thornton Dill) and Gender through the Prism of Difference (with Pierrette Hondagneu-Sotelo and Michael Messner). She is the coauthor (with D. Stanley Eitzen) of Social Problems and Diversity in Families, both of which won McGuffey Awards for longevity from the Text and Academic Authors Association, and Globalization: The Transformation of Social Worlds. She has served as president of the Western Social Science Association. In 2000, she received the American Sociological Association’s Jessie Bernard Award in recognition of her career achievements in the study of women and gender. Kelly Eitzen Smith received her Ph.D. from the University of Arizona. She is currently working as a researcher and technical consultant at the Drachman Institute, University of Arizona. The Drachman Institute is the research and public service unit of the College of Architecture and Landscape Architecture dedicated to the environmentally sensitive and resource-conscious development of neighborhoods and communities. Her current projects and research interests involve sustainable communities and transit-oriented development. She is the coauthor of Social Problems (Twelfth Edition, with D. Stanley Eitzen and Maxine Baca Zinn) and Experiencing Poverty: Voices from the Bottom (Second Edition, with D. Stanley Eitzen).